It was August. Where were the tomatoes? June rains and mild temperatures throughout July and August had delayed the growing season. But, in September – finally! – the tomatoes had ripened and were appearing in CSA shipments and farmers’ markets in Northern California. With only a few weeks to enjoy the long-awaited culinary treasures, I went into a buying frenzy. Now that I had them, what, exactly, was I planning to do with them all? I have a small refrigerator freezer, and an advanced case of “fear of canning” – mainly because I don’t want to poison my loved ones. 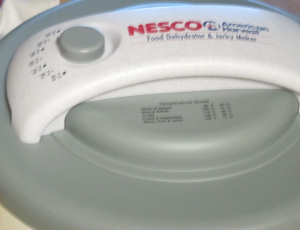 The NESCO American Harvest Food Dehydrator to the rescue! For the past two weeks, my NESCO has been running day and night to prepare for the dreaded tomato-less winter months. 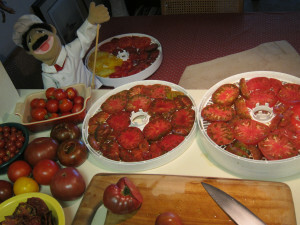 My assistant, Al Dente, encourages me to preserve tomatoes for sauces in the winter months. 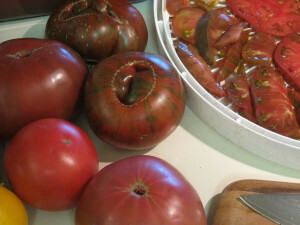 Slice tomatoes into 3/8″ inch rounds, and place onto the four trays provided. Set the temperature to 135°, and let the NESCO work its magic. I used Cherokee heirloom tomatoes. About 12 hours later, you’ll have dried tomatoes for soups, stews, casseroles and other winter recipes. 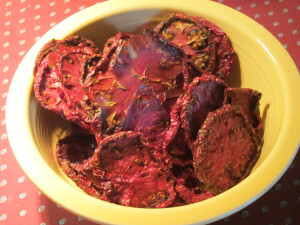 Dried tomatoes have an intense flavor, add only a small handful to your recipes. According to the easy-to-read NESCO instruction booklet, you’ll need to check for dryness to ensure all moisture has evaporated: Simply tear a tomato, and look for moisture drops along the tear. 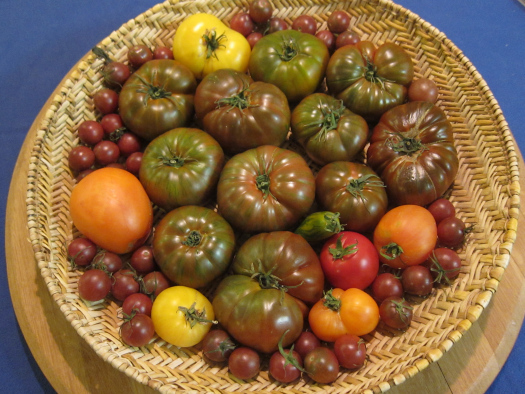 If there are no droplets, the tomato is sufficiently dry for long-term storage in air-tight containers. Package tomatoes for storage immediately, and store containers in a cool dark cabinet or your refrigerator. The ideal storage temperature is 60° to below freezing. Now you can enjoy summer tomatoes – all winter long! Next PostNext Celebrate Sustainability on November 8!